This article based on heltec WiFi Kit 32. This a board based on ESP32 with WiFi, Bluetooth, LoRa. 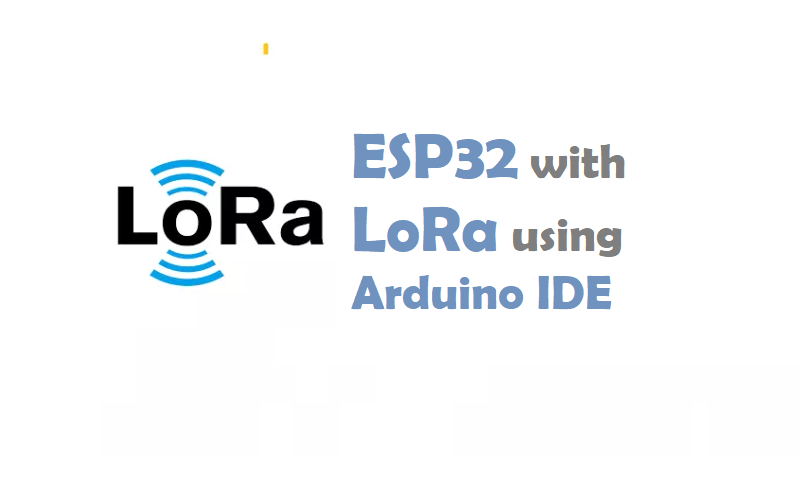 In the post “ESP32 LoRa Tutorial” you can learn how to use Lora with ESP32. Remember : LoRa is not available in Every ESP32 Board. I used Heltec WiFi 32 and TTGO LoRa 868 Boaard in this tutorial. WiFi + bluetooth + LoRa – Support WIFI802.11 b/g/n/e/i ,Traditional bluetooth and BLE low-power dual-mode bluetooth. Provide exclusive LoRaWAN protocol source code running on ESP32 and provide technical support. Highly integrated – Integrate the functions of MCU, SX125x LoRa chip, radio frequency loop switch, radio frequency circuit, lithium battery management, USB to serial port, etc. Users only need a Micro USB connection to get complete wi-fi, bluetooth and LoRa functions. More stable performance – The new version of WIFI LoRa 32 has redesigned the circuit part and upgraded the safety and stability of the circuit on the premise of keeping the pin order and the previous generation unchanged.Including better impedance matching and more scientific power supply circuits. Work at 30 ° C to + 80 ° C temperature range. Perfect for the LoRaWAN protocol – The LoRa + LoRaWAN protocol is the most mature and stable narrowband Internet of things communication technology. The long distance – LoRa spread spectrum communication has the characteristics of long communication distance. Under the premise of good impedance matching and sufficient power supply, in the open area, our communication distance can reach 3Km. The large capacity – On the premise of cooperating with LoRa Gateway，A gateway can communicate with more than 1,000 nodes. Security – LoRaWAN is the first Internet of things to propose double encryption, preventing the possibility of radio eavesdropping. Low power consumption – On the basis of the LoRaWAN source code provided by Semtech, we made a lot of improvements to the low-power part of the code. Within one transmission cycle of the system, only a few milliseconds were in the working state, and the rest of the time was in the deep sleep state.For example, if my application sends a set of data in 8 hours, the whole system runs in milliseconds during those 8 hours, and the rest of the time is in deep sleep.This can greatly reduce the use of batteries. Heltec successfully transplanted the LoRaWAN protocol to the ESP32 + Arduino platform, using internal RTC, and supporting deep sleep.Users only need a simple configuration to complete the application of LoRaWAN. Based on Arduino source codes and toolchain for WiFi_Kit_series made by HelTecAutomation. Visit this github link https://github.com/Heltec-Aaron-Lee/WiFi_Kit_series. LoRa is a wireless data communication technology that uses a radio modulation technique that can be generated by Semtech LoRa transceiver chips. LoRa allows long range communication of small amounts of data (which means a low bandwidth), high immunity to interference, while minimizing power consumption. So, it allows long distance communication with low power requirements. Because these bands are unlicensed, anyone can freely use them without paying or having to get a license. Check the frequencies used in your country. You can also build a LoRa network using LoRaWAN. The LoRaWAN protocol is a Low Power Wide Area Network (LPWAN) specification derived from LoRa technology standardized by the LoRa Alliance. We won’t explore LoRaWAN in this tutorial, but for more information you can check the LoRa Alliance and The Things Network websites. Now i have TTGO lora 868. you can use this board If you successfully installed WiFi 32 kit. because this compatible with above configuration. Click Tools Tab and select “WiFi_Lora_32”Board. Click Tools tab and Select Port. Now Go to File>Example> Lora Library and select Lora Sender example program and Flash it. Now Flash Lora Receiver Program in another Board. Open Serial Monitor For logs. Similarly you can try another Examples. I hope you like this post “ESP32 LoRa Tutorial”. If have a query related to this post “ESP32 LoRa Tutorial”. Do you have any questions? Leave a comment down below!Thanks for reading. If you like this post probably you might like my next ones, so please support me by subscribing my blog.